Private car, boats in tour and English or French speaking tour guide. The floating market in Cai Be. Cat-fish farm & Cham Minority Village. Fast boat to Cambodia/Phnom Penh. 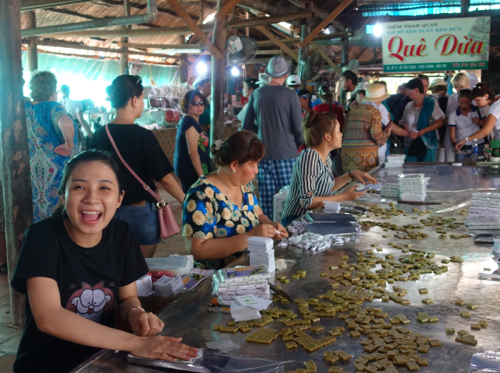 In the morning:Private Car/van picks you up at hotel and travel to Cai Be Floating market around 3 hours driving, Start Mekong Delta - Cai Be Floating Market 1 Day Tour. On our dedicated private car/van you can see the green paddy fields stretching towards the horizontal. When you arrive Cai Be, you’ll board a motorized boat that takes you to the floating market and spend 1 hour there for an interaction that you’ll see no where else in the world. When you feel it's enough for the serenity, let's get back to the large motor boat for something different in An Binh Island (or Tan Phong Island). It is well-known fresh fruits whole year. 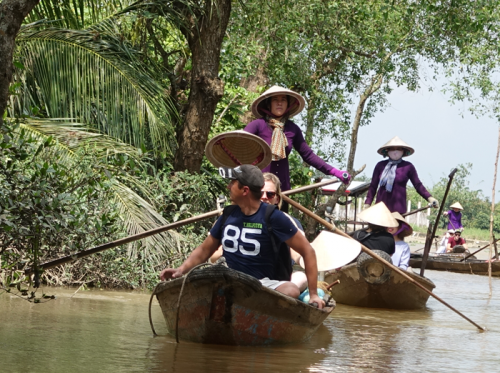 On the way, we have a chance to look the sightseeing 2 long sides river and find out the life of rural people in Mekong Delta. In the afternoon: we get on small row boats. During this 20 minutes trip, your boat will zigzag thru a maze of shadow canals to enjoy the fresh air along the canal and beautiful water coconut tree scenery. 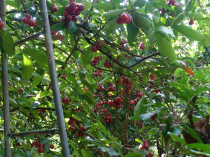 Then we will roam through a village about 20 minutes to check out our natural landscape with quite and peace villages or we can relax on a hammock for a short rest in Mekong Delta. The next stop is Vinh Long City from An Binh Island (35 minutes by boat) .We will land on a marketplace and walk around to see how and what the poor rural people of Vietnam sell. You are encouraged to interact with the vendors and see how friendly and respectful they are. You might also buy many interesting things for very little amount of money. After this, our bus takes you to Chau Doc. 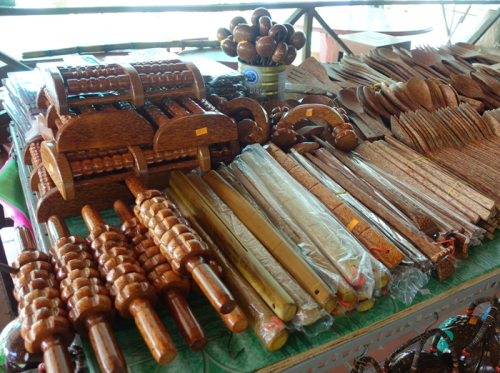 On the way, we will stop at Long Xuyen to visit Crocodile farm and Thot Bot Bird Sanctuary. And we will continue to Chau Doc. We stay over night in Chau Doc. We will have breakfast. And after breakfast, our guide will take you to travel downs the canals and backwaters of the main Mekong Channel visit catfish farm and Cham Tribal Village by motorboat. 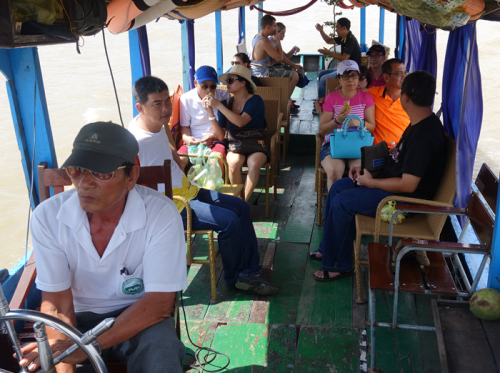 Then guide will transfer us to the boat station and catch the boat to Cambodia - Phnompenh. 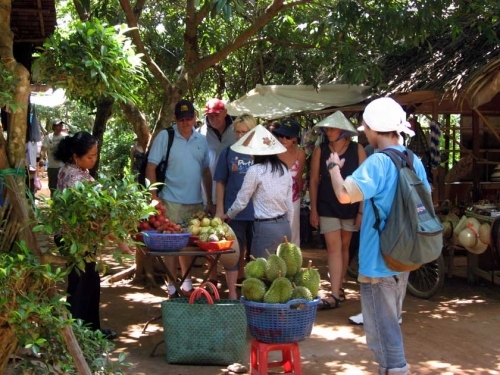 Finish 2 Days 1 Night Mekong Delta Tour - Cambodia (Cai Be - Chau Doc - Phnompenh). Transportation: Private car, boat trips & to Cambodia/Phnompenh. Guide: English or French speaking tour guide. Meal: 01 lunch, 01 dinner, 01 breakfast. Mineral water: two water bottles/pax/two days. - Fast boat: Directly to Centre of Phnompenh..
Tu Trang Boat (Departure Time: 07.00am - Arrival Time: 11.30am). Tips, drinks, personnel expenses and Cambodia Visa. Please arrange 25usd for Cambodia Visa. With clients had Cambodia E-Visa, clients just go to the Bavet/Moc Bai border crossing, the Poipet/Aranyaprathet border crossing and the Koh Kong/Had Lek border crossing or get it at Siem Reap International Airport, Phnom Penh International Airport.